Having won their last three games in the Premier League, Arsenal will be heading to Goodison Park tonight in high spirits. 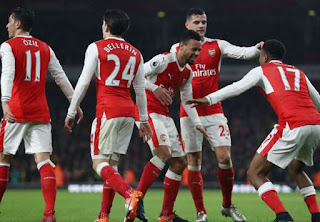 They came back from a goal down last weekend to defeat Stoke City 3-1 with goals from Theo Walcott, Mesut Ozil and Alex Iwobi. They will be going into the game with injuries to some key players and as such, there will be a slight difference in the starting lineup we saw on Saturday. Hector Bellerin made a comeback from injury in the 24th minute against Stoke after Shkodran Mustafi sustained a hamstring injury and is expected to make a start in today's encounter. Gabriel Paulista is expected to occupy the central defence slot alongside Laurent Koscielny since Mustafi has been ruled out for the next three weeks. Below is the predicted Arsenal starting lineup for their sixteenth Premier League fixture for the season. Cech; Bellerin, Gabriel, Koscielny, Monreal; Coquelin Xhaka; Oxlade-Chamberlain, Ozil, Walcott; Sanchez.